Well, keep that garden hose handy. Other than a very slim chance for a spotty shower for the Eastern Miami Valley this morning, we will be dry for the rest of the seven day forecast. Champaign County had a quick pop-up shower about an hour ago, but things are already dry again. We also have a little light fog this morning with partial clearing and winds calming down just a little bit. The cold front should push through the area later this morning and early afternoon. Once that moves through we will see the winds switch to the north and then slowly clearing out for the next few days. Plenty of sunshine through the start of the weekend and then a few more clouds will start to roll in Sunday and Monday, but any rain looks to stay just west of here. We will likely see rain the middle of next week, but nothing until then. Our highs the next few days will be near 80 and then mid-upper 80's for the weekend so the heat will be returning. Watch out for that fog and have a good one! 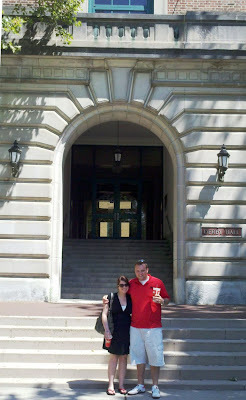 Ah, good memories of Ohio State (oops, THE Ohio State University). Very nice image of you and your wife. Got a boat or pool? Got my number?